I have the great pleasure of walking dogs today. Taking a walk with a person versus taking a walk with two dogs are two different experiences. Walking with a person means compromising on pace and distance based on someone else’s mood. Walking with dogs means I get to set the pace and distance, but only if I’m willing to enforce a no-pulling rule. Although I accommodate sudden stops of the dogs’ choosing whether for potty breaks or sniffing. Since I don’t want the dogs to pull me, I figure I shouldn’t pull them. Fortunately, these dogs are trained to walk with a gentle leader. This makes things considerably easier. If they start to pull, I stop until the leash goes slack. That’s my goal–to get them to walk so the leash has a little slack. After a few times, they seem to understand and we walk at the pace I choose. At least until they stop. One dog seems to like to sniff a lot. I eventually realize that she is actually trying to rub off her gentle leader. I decide to distract her by going for a short, slow jog. This works well until the other dog suddenly needs to poop. Apparently there is some kind of trigger that once one dog poops, the other dog will have to poop exactly 10 steps after I have tied a knot in the poop bag, forcing me to use a second bag. That is another difference between walking with humans and dogs–on a good day, the former doesn’t require picking up poop in a plastic baggie. We wind our way around a paved trail that goes through the woods. They try to walk on fallen leaves or grass whenever possible. Interestingly, neither dog wants to walk in mud or puddles. They go around puddles without any encouragement from me. I smile at this. 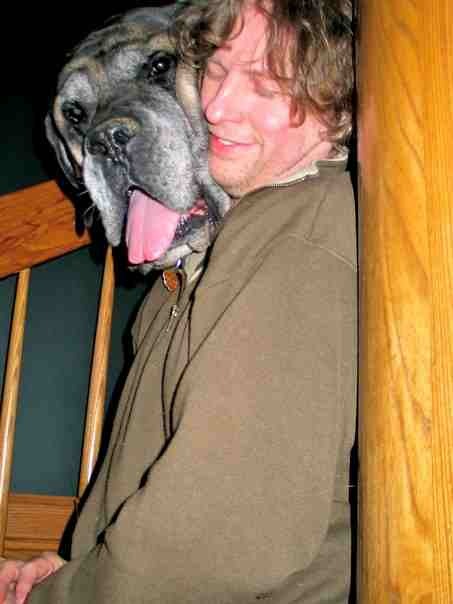 We used to have two English Mastiffs who never really noticed what they were walking through. They would leave giant paw prints that would have strangers stopping and wondering if a bear or lion was loose in the neighborhood if they had never seen our dogs (and sometimes when they were looking at our dogs). Then, when we got home, we would have a pile of “dog towels” by the door that we would use to wipe the mud off of their feet. They were pretty good about standing and letting us wipe their paws, but it was hard to keep the one who went second from walking all over the place with their big muddy paws while they waited. There are a lot of days when I miss having to wipe muddy paws. Today, I will have no muddy paws to wipe–these dogs are more dainty than I am when it comes to staying out of the mud. But as we jog along briefly, the accompanying jingle of dog tags makes me feel like it’s going to be a good day. This entry was posted in Adventure, Family, fitness, Friends, walking and tagged Dog, Paw, Pets, Recreation, walking. Bookmark the permalink.